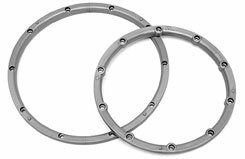 All Products > "3242 HPI Racing Wheel Bead Lock Rings (Silver)"
Whether you are performing the great leaps of fire or connecting the triple-double on the back stretch, do it in style with these coloured Bead Locks for your Baja 5B. Includes 2 small & 2 large bead lock rings and 44 screws, enough for 2 complete wheels. These Bead Locks are a factory replacement for the front Baja 5B wheels.